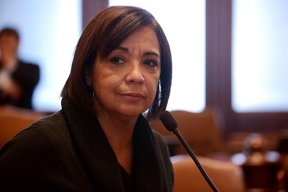 Majority Caucus Whip Iris Y. Martinez (D-Chicago) participated in a two-day Senate Special Committee on Pensions and Investments Hearing this week regarding the diversity of pension investment managers. “It became apparent at this hearing that more work needs to be done by public employee pension systems to meet diversity goals,” Martinez said. 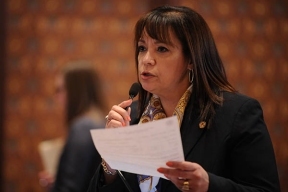 “I’m particularly concerned that the numbers for Latinos are low.” Under Illinois law, public employee pension systems must set and work toward meeting diversity goals. They must increase access to state contracts for investment management firms, brokerages and other vendors owned by minorities, women or people with disabilities. The hearing featured testimony from representatives of state, county and municipal pension funds. “I was not impressed by a lot of the testimony I heard,” Martinez said. “Many of these pension fund representatives come before the committee year after year and say that they are working to hire more diverse investment managers. However, it doesn’t seem like significant improvement is being made. What I’m looking for are results.” By January 1, 2016, each pension system must adopt a goal of investing at least 20 percent of its funds with emerging investment managers and using businesses owned by minorities, women or persons with disabilities for 20 percent of its contracts. Since 2004, the Senate has held annual hearings to receive updates from the pension systems on their progress in meeting diversity goals and efforts to ensure investment managers doing business with Illinois reflect the state’s population.